Each of us is influenced and shaped by important people who pass through our lives. Last week, I attended the funeral of an especially important person in my life - my 91-year-old grandmother. When I first learned of her death, a flurry of thoughts and emotions ran through my mind. I reflected on the lessons she taught me and the values she modelled. She was an amazing woman. While she did not have formal higher education, she insisted that we did. 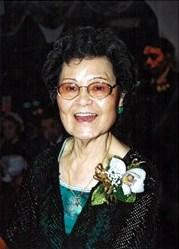 While she grew up in an environment of intolerance toward Chinese Canadians, she demanded that we understand the importance of understanding and acceptance and behave accordingly. She had four children, nine grandchildren and 11 great-grandchildren. She was loyal and wanted the best for her family. She set our standard for ethics, empathy, compassion and generosity and was unwavering in her expectations that we live to those standards. She believed in leaving our world better than she found it. She worked hard, treated others with respect and led by example. These are the values that shape me and contribute to my commitment to community and public service. But her death caused me to reflect on how these values are manifested in the level of civility in our society. I thought about if or how we inspire our children to emulate these values and how our institutions reflect these qualities. As an elected official, I appreciate that I have to conduct myself appropriately. I know most politicians - whether they are elected to serve municipal, provincial or federal office - also take this responsibility seriously. Yet, every year when our elected officials return to their respective legislative settings, we hear public concern about combative, divisive and ill-mannered behaviour between them. Even those who are on record about seeking more civil exchanges seem to participate. School children often visit our provincial and federal capitals to attend question period, only to observe aggressive and confrontational exchanges. In our democracy, political parties engage in partisan exchanges that articulate firmly held perspectives and high emotions, contributing to noisy and boisterous exchanges about important and serious issues. It is crucially important that different views be expressed and challenged in our legislative houses. But I wonder if the lack of decorum and personal attacks will erode confidence in our governing institutions. Most people who choose to stand for public office do so because they want to make a difference and leave our society in a better place. Our political institutions exercise authority on behalf of the nation, serve the diverse demands of constituents and develop important laws for a technologically and politically complex country. By its very nature, differences of opinion are real and necessary. The work of our political institutions - whether school boards, legislatures or municipal halls - is important and impacts our lives every day. It is, however, incumbent on political leaders to shape and meaningfully respond to concerns about the growing negative perceptions of those institutions. Our voice matters in a democracy and the lack of civility - real or perceived - should be a cause for concern for our elected officials. My grandmother was our family's matriarch whose values and influence reached across generations. She understood actions are more powerful than words. How she conducted herself was as important as her words. Our political leaders would do well to take a page from her book.